Rich Cohen enters the Stones epic as a young journalist on the road with the band and quickly falls under their sway--privy to the jokes, the camaraderie, the bitchiness, the hard living. Inspired by a lifelong appreciation of the music that borders on obsession, Cohen's chronicle of the band is informed by the rigorous views of a kid who grew up on the music and for whom the Stones will always be the greatest rock 'n' roll band of all time. The story begins at the beginning: the fateful meeting of Mick Jagger and Keith Richards on a train platform in 1961--and goes on to span decades, with a focus on the golden run--from the albums Beggars Banquet (1968) to Exile on Main Street (1972)--when the Stones were prolific and innovative and at the height of their powers. Cohen is equally as good on the low points as the highs, and he puts his finger on the moments that not only defined the Stones as gifted musicians schooled in the blues and arguably the most innovative songwriters of their generation, but as the avatars of so much in our modern culture. In the end, though, after the drugs and the girlfriends and the rows, there is the music. The Sun & The Moon & The Rolling Stones makes you want to listen to every song in your library anew and search out the obscure gems that you've yet to hear. The music, together with Cohen's fresh and galvanizing consideration of the band, will define, once and forever, why the Stones will always matter. 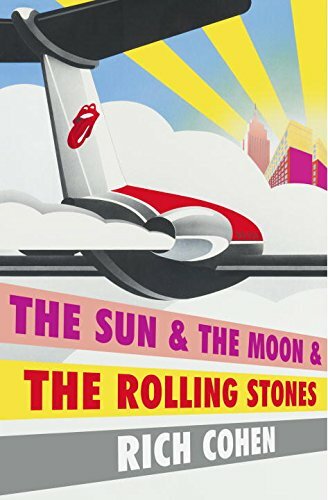 Praise for "The Sun and the Moon and the Rolling Stones"
Rich Cohen writes like Mick Jagger sings: He s full of energy, swagger, and creativity. In one sense, this book is easy to categorize: File under books that are awesome and delightful to read. But it s also hard to categorize. It s part memoir, part cultural history, part biography, part manifesto, part behind-the-scenes look at the joyful debauchery of one of the world s greatest bands. However you label it, you ll have a blast reading it. A. J. Jacobs"
Rich Cohen is one of the select few to be invited behind the curtain of the Rolling Stones real-life rock n roll circus, but he never loses the perspective of having once been a kid staring in awe at his brother s poster of the band. With "The Sun and the Moon and the Rolling Stones, " Cohen separates the men from the myth, while also reinforcing why this group means so much to so many of us. Alan Light, author of "The Holy or the Broken: Leonard Cohen, Jeff Buckley & the Unlikely Ascent of Hallelujah ""
I have no interest in the lives of rock stars. I could not put down "The Sun & The Moon & The Rolling Stones." Rich Cohen was born to write this book, and he waited just long enough to do it. Reporting the hell out of a lifelong obsession, he gives us the Rolling Stones in so many dimensions they stalk off the page. The fanboy becomes a man, with judgments seasoned, supple, razor-sharp, slyly funny, and still besotted. A great story, masterfully told. William Finnegan"
Fabulous . . . [Rich] Cohen interweaves his firsthand accounts of the men in the band with the well-trodden history of the Stones, from inception around 1963 through the golden period of 1968 to 1973 and then hopscotching through time to bring us up to when he met the band. The research is meticulous. . . . Cohen s own interviews even yield some new Stones lore. "The Wall Street Journal"
No one can tell this story, wringing new life even from the leathery faces of mummies like the Rolling Stones, like Rich Cohen. . . . Cohen writes about survivors. Men who will not allow life to grind them down. . . . The book beautifully details the very meaning of rock n roll the timeless swagger and the way the imperfections of the Stones their meter, their faces, even Mick s accidentally bitten tongue embody the dangerousness of kid-oriented popular music. "New York Observer"
Masterful . . . Hundreds of books have been written about this particular band and [Cohen s] will rank among the very best of the bunch. "Chicago Tribune"
Cohen, who has shown time and time again he can take any history lesson and make it personal and interesting . . . somehow tells the [Stones ] story in a whole different way. This might be the best music book of 2016. "Men s Journal"
[Cohen s] account of the band s rise from footloose kids to old, clean, prosperous stars is, like the Stones, irresistible. "People"
Cohen approaches the Stones from two directions. He is the kid discovering the group from muffled, glorious sounds emerging from his older brother s room in the attic. Later, he gets on the inside as a young magazine writer, backstage as he works his way into the good graces of the aging rockers. . . . You will, as with the best music bios, want to follow along on vinyl. "The Washington Post"
A fresh take on dusty topics like Altamont and the Stones relationship with the Beatles . . . Cohen takes pilgrimages to places like Nellcote, the French mansion where the Stones made "Exile on Main Street, "and recounts fascinating moments from his time on tour. "Rolling Stone"
On the short list of worthwhile books about the Stones . . . The book is stuffed with insights. "San Francisco Chronicle"
Cohen s fresh history of the Rolling Stones is a personal rock and roll memoir that covers the band s long life with candor, humor and a little awe. "Shelf Awareness"
Rich Cohen is the author of the New York Times bestsellers Tough Jews, The Avengers, Monsters, and (with Jerry Weintraub) When I Stop Talking, You'll Know I'm Dead. He is a co-creator of the HBO series Vinyl and a contributing editor at Vanity Fair and Rolling Stone and has written for The New Yorker, The Atlantic, and Harper's Magazine, among others. Cohen has won the Great Lakes Book Award, the Chicago Public Library's 21st Century Award, and the ASCAP Deems Taylor Award for outstanding coverage of music. His stories have been included in The Best American Essays and The Best American Travel Writing. He lives in Connecticut.